Malaria, trypanosomiasis and leishmaniasis have an overwhelming impact in the poorest countries in the world due to their prevalence, virulence and drug resistance ability. Currently, there is inadequate armory of drugs for the treatment of malaria, trypanosomiasis and leishmaniasis. This underscores the continuing need for the discovery and development of new anti-protozoal drugs. Consequently, there is an urgent need for research aimed at the discovery and development of new effective and safe anti-plasmodial, anti-trypanosomal and anti-leishmanial drugs. Bioassay-guided chromatographic fractionation was employed for the isolation and purification of antiprotozoal alkaloids. The methanol extract from the leaves of Annickia kummeriae from Tanzania exhibited a strong anti-plasmodial activity against the multi-drug resistant Plasmodium falciparum K1 strain (IC50 0.12 ± 0.01 μg/ml, selectivity index (SI) of 250, moderate activity against Trypanosoma brucei rhodesiense STIB 900 strain (IC50 2.50 ± 0.19 μg/ml, SI 12) and mild activity against Leishmania donovani axenic MHOM-ET-67/82 strain (IC50 9.25 ± 0.54 μg/ml, SI 3.2). Bioassay-guided chromatographic fractionation led to the isolation of four pure alkaloids, lysicamine (1), trivalvone (2), palmatine (3), jatrorrhizine (4) and two sets of mixtures of jatrorrhizine (4) with columbamine (5) and palmatine (3) with (−)-tetrahydropalmatine (6). The alkaloids showed low cytotoxicity activity (CC50 30 - >90 μg/ml), strong to moderate anti-plasmodial activity (IC50 0.08 ± 0.001 - 2.4 ± 0.642 μg/ml, SI 1.5-1,154), moderate to weak anti-trypanosomal (IC50 2.80 ± 0.001 – 14.3 ± 0.001 μg/ml, SI 2.3-28.1) and anti-leishmanial activity IC50 2.7 ± 0.001 – 20.4 ± 0.003 μg/ml, SI 1.7-15.6). The strong anti-plasmodial activity makes these alkaloids good lead structures for drug development programs. Protozoal diseases such as malaria, trypanosomiasis and leishmaniasis have an overwhelming impact in the poorest countries in the world . Due to their prevalence, virulence and drug resistance, they are the most serious and widespread parasitic diseases in the tropics [1–5]. The inadequate armory of drugs for the treatment of malaria, trypanosomiasis and leishmaniasis; and the high cost of new drugs coupled with the rapid development of resistance to new anti-parasitic drugs are some of the limiting factors in the fight against these tropical diseases. This underscores the continuing need for the discovery and development of new anti-protozoal drugs. Consequently, there is an urgent need for research aimed at the discovery and development of new effective and safe anti-plasmodial, anti-trypanosomal and anti-leishmanial drugs. In view of the complicated situations in dealing with parasitic infections, chemotherapy remains a dependable strategy in disease control. In the development of new drugs, the plant kingdom is considered to be important source for lead compounds owing to the successful use in traditional treatment of various ailments since antiquity . Historically, medicinal plants have served as sources of new pharmaceutical products like quinine and artemisinin  and inexpensive starting materials for the synthesis of many known drugs. Research focused on the identification of medicinal natural products from higher plants for the discovery of new parasitic agents has been ongoing for more than five decades. Ethnomedical information revealed that several Annickia (formerly Enantia) species are used widely for the treatment of malaria and other ailments . Enantia chlorantha and E. polycarpa are used traditionally in the treatment of malaria and fever in West and Central Africa [9, 10]. Consequently, previous pharmacological investigations on genus Enantia revealed promising anti-protozoal activity with the stem-bark extract of E. chlorantha showing strong in vitro anti-plasmodial activity against P. falciparum K1 strain (IC50 0.126 μg/ml) and good selectivity (SI 616) . Furthermore, E. chlorantha aqueous and ethanolic extracts exhibited in vivo activity with ED50 values of 6.9 mg g-1 and 0.34 mg g-1, respectively, against Plasmodium yoelii in experimentally infected mice . The chemistry of E. chlorantha and E. polycarpa has been extensively studied [10, 13–15]. Several quinoline and isoquinoline alkaloids including protoberberines, quinine and dihydroquinidine have been isolated from E. polycarpa[16, 17]. Protoberberine alkaloids have been identified as the major anti-protozoal alkaloids in E. chlorantha and E. polycarpa[16–19]. 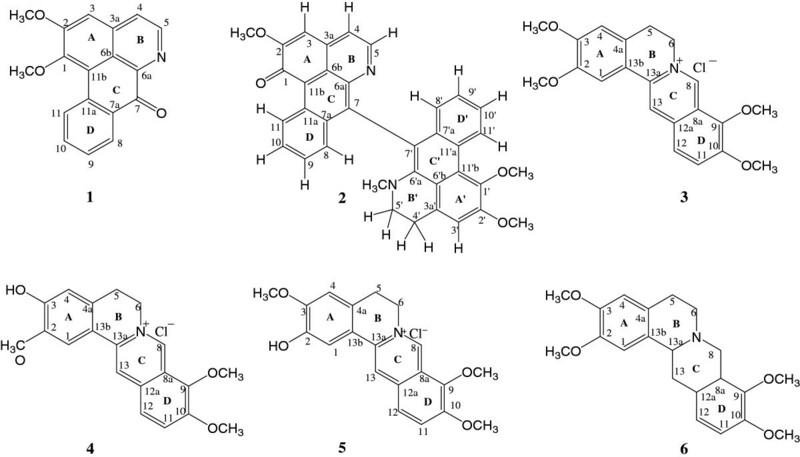 Protoberberines isolated from Enantia chlorantha exhibited significant antiplasmodial activity against both CQ-sensitive and resistant strains of P. falciparum: palmatine (3) (IC50 0.27 and 0.16 μg/ml, respectively) and jatrorrhizine (4) (IC50 4.2 and 1.61 μg/ml, respectively) in vitro. A mixture of protoberberine alkaloids from Enantia chlorantha containing; palmatine (3), jatrorrhizine (4) and columbamine (5) (Hepasor), were shown to prevent liver injury from chemically induced traumatization and also promoted the healing process after the injury  in experimental mice. Palmatine (3) and jatrorrhizine (4) demonstrated to inhibit the growth of Babesia gibsoni at concentrations ranging from 100 and 10 μg/ml . In an effort to identify the molecular basis of activity, we undertook bioassay-guided fractionation of extracts of Annickia kummeriae (Engl. & Diels) Setten & Maas (formerly, Enantia kummeriae), a plant traditionally used for the treatment of malaria in Tanzania. Bioassay-guided chromatography led to the isolation of lysicamine (1), trivalvone (2), palmatine (3), jatrorrhizine (4) and two sets of mixtures of jatrorrhizine (4) with columbamine (5) and palmatine (3) with (−)-tetrahydropalmatine (6) as shown in Figure 1. Analytical grade and double-distilled solvents were used for the extraction and chromatographic isolation and purification of compounds. Analytical thin layer chromatography (TLC) was performed on both aluminium and plastic sheets precoated with silica gel 60 F254 (Merck) with a 0.2 mm layer thickness. Visualisation of TLC spots was carried out under UV light at 254 or 366 nm and by spraying with Dragendorff reagent. Preparative thin layer chromatography (PTLC) was done using normal phase silica gel 60 F254 (Merck) precoated on glass plates (20 × 20 cm), with varying thickness (0.5, 1.0 or 2.0 mm). Detection was done under UV light at 254 or 366 nm. Preparative high speed counter-current chromatograph (HSCCC) was done on Potomac (P.C. Inc., Buffalo, NY-USA) equipped with three preparative multilayer coils (wound with 1.7 mm internal diameter, polytetrafluoroethylene PTFE tubing of 80 ml and 240 ml connected in series with a total capacity of 320 ml) run at a revolution speed of 611 rpm and the solvent was pumped into the column with a Büchi B-688 chromatography pump. Continuous monitoring of the effluent was achieved with a Model UV-II detector Monitor at 254 nm. A manual sample injection valve with a 20 mL loop was used to introduce the sample into the column and the eluent collected in a Büchi B-684 fraction collector. Melting points of recrystallized solids were measured on a Büchi B-540 apparatus and are uncorrected. IR spectra were measured on a Perkin Elmer model 1600 FT-IR spectrophotometer using potassium bromide pellets. Mass spectra were measured on mass spectrometer VG 70S (EIMS) and a Finnigan MAT 312 FABMS. NMR spectra were measured on Bruker Avance 400 (1H NMR 400 MHz; 13C NMR 101 MHz), Bruker VRX 500 (1H NMR 500 MHz; 13C NMR 125 MHz) and Bruker DRX 600 (1H NMR 600 MHz; 13C NMR 150.9 MHz). The purity level was determined by LC-MS (Agilent 1100 system equipped with an Agilent 1100 DAD MS detector; column Nucleodur C18, 5 μm, 125 mm × 4.0 mm internal diameter (i.d); mobile phase A: 0.01% aqueous formic acid and mobile phase B: acetonitrile). The structures were assigned by NMR and mass spectrometry. The isolated compounds were screened for anti-plasmodial, anti-trypanosomal, anti-leishmanial and cytotoxic activity. Plant materials were collected at Amani Nature Reserve (Tanzania) in August 2003 and identified at the Department of Botany, University of Nairobi (Kenya) where the voucher specimen (HM 2004/04) is deposited in the Herbarium. The plant materials (leaves, root-bark and stem-bark) were dried under shade for 14 days and ground to powder. The ground air-dried Annickia kummeriae leaves, stem and root bark (1.12, 1.55 and 1.77 kg, respectively) were extracted sequentially, at room temperature for 48 hours with intermittent shaking, with petroleum ether (PE), dichloromethane (DCM) and methanol (MeOH). The extract was filtered off, the solvent removed under reduced pressure at 30°C, dried further under a stream of nitrogen for 24 hours before being weighed and used for biological assays. Chemicals used were: Formic acid, hydrochloric acid, sulphuric acid, acetic acid, citric acid, p-anisaldehyde, vanillin, dragendorf reagent, sodium chloride, sodium hydrogen carbonate, acetone, n-hexane, petroleum ether, dichloromethane, chloroform, ethyl acetate, toluene, ethanol and methanol were also bought from Kobian Chemicals, Nairobi, Kenya and Fluka AG in Switzerland. Analytical grade or double-distilled solvents were used for the extraction and chromatographic isolation and purification of compounds. [3H]-Hypoxanthine and Rosewell Park Memorial Institute 1640 (RPMI 1640) powdered medium were bought from Gibco Laboratories, California, U.S.A whereas, dextrose, Giemsa stain, resazurin dye, glycerol and N-2-hydroxyethylpiperazine N-2-ethanesulfonic acid (HEPES) were bought from Sigma-Aldrich, Germany. Deuterated solvents: chloroform and methanol used for spectroscopic analysis were bought from Fluka AG, Switzerland. Anti-plasmodial activity was evaluated against the multi-drug resistant Plasmodium falciparum K1 strain (resistant to chloroquine and pyrimethamine), using the parasite cultivation method of Trager and Jensen, 1976  and the assay originally described by Desjardins et al., 1979  with slight modifications by Matile & Pink . The in vitro anti-trypanosomal activity was evaluated against Trypanosoma brucei rhodesiense STIB 900 strain, using the cultivation method of Baltz et al., 1985  whereby the Minimum Essential Medium (MEM) was supplemented with 0.2 mM 2-mercaptoethanol, 1 mM sodium pyruvate, 0.5 mM hypoxanthine and 15% heat-inactivated horse serum. The assay was performed according to Räz et al., 1997 . The in vitro anti-leishmanial assay was carried out against axenic amastigote forms of Leishmania donovani MHOM-ET-67/82 strain according to the procedure described by Ganapaty et al., 2006 . The ground air-dried leaves, stem bark and root bark of Annickia kummeriae (1.12 kg, 1.55 kg and 1.77 kg, respectively) was extracted sequentially with solvents of increasing polarity (petroleum ether, dichloromethane and methanol) for 48 hours at room temperature. The resulting extracts were obtained by filtration and concentration in vacuo at 30°C. After screening for anti-plasmodial, anti-trypanosomal, anti-leishmanial and cytotoxic activity, the crude methanolic leaf extract, which was the most active, was selected for bioassay-guided fractionation and isolation of anti-protozoal compounds. The methanolic leaf extract (3 g) was fractionated using HSCCC through stepwise elution with a biphasic solvent system (CHCl3:MeOH:0.2 M HCl 7:3:4, v/v/v) to yield 17 fractions which were screened for anti-plasmodial and cytotoxic activity. The HSCCC fractions AKLM 4-AKLM 6 and AKLM 7-AKLM 10, which exhibited anti-plasmodial activity, were combined based on similarity of the TLC profile. Repeated HSCCC of fraction AKLM 2 using stepwise elution with a biphasic solvent system (CHCl3:MeOH:0.2 M HCl 7:3:4) gave 11 sub-fractions (AKLM 1-AKLM 11) which were screened for anti-plasmodial and cytotoxic activity. Column chromatography of sub-fractions AKLM 2.10 and AKLM 2.11 on silica gel (0.040–0.063 mm) eluting with C6H14-EtOAc 1:1, and EtOAc-MeOH 8:2 followed by purification with sephadex LH-20 eluting with MeOH-CHCl3 1:1 and preparative TLC (PTLC) on silica gel PF254 with CHCl3:MeOH:HCO2H 98:1.8:0.2 yielded (10.21 mg) of lysicamine (1) ( 0.01% yield, 92% purity) and (8.10 mg) of trivalvone (2) (0.01% yield:, 95% purity), respectively. Repeated HSCCC eluting with CHCl3:MeOH:0.2 M HCl 7:3:4 of the combined fractions AKLM 7-AKLM 10 gave 20 sub-fractions (AKLM 7.1-AKLM 7.20). TLC analysis indicated a similar pure compound in AKLM 7.6-AKLM 7.13 which was recrystallized from methanol to yield (1.52 g) of palmatine (3) (1.84% yield, 91% purity). Column chromatography (silica gel 0.040–0.063 mm) of sub-fractions AKLM 7.15-AKLM 7.16, with similar TLC profiles, eluting sequentially with CHCl3:MeOH:HCO2H 9:0.75:0.25, 8:1.75:0.25, 6:3.75:0.5 and 5:4.5:0.5 followed by recrystallization from methanol yielded (40.82 mg) of jatrorrhizine (4) (0.05% yield, 94% purity). Repeated HSCCC of of the combined fractions AKLM 4-AKLM 6 with CHCl3:MeOH:0.2 M HCl 7:3:4 gave 16 sub-fractions (AKLM 4.1-AKLM 4.16). Column chromatography (silica gel 0.040–0.063 mm) with MeOH;CH2Cl2:HCO2H 4:15:1 followed by PTLC (silica gel PF254) with MeOH-CH2Cl2-HCO2H 5:14:1 gave (34.2) of an inseparable mixture (1.2:1.0) of jatrorrhizine (4) and columbamine (5) (0.04% yield). Similarly, HSCCC of of AKLM 16 with CHCl3:MeOH:0.2 M HCl 7:3:4 gave 12 sub-fractions (AKLM 16.1-AKLM 16.12). Column chromatography (silica gel 0.040–0.063 mm) of the combined sub-fractions AKLM 16.8-AKLM 16.10 with MeOH;CH2Cl2;HCO2H 5:14:1 followed by PTLC (silica gel PF254) with MeOH:CH2Cl2-HCO2H 4:15:1 yielded (28.2 mg) of an inseparable mixture (1.1:1.0) of palmatine (3) and (−)-tetrahydropalmatine (6) (0.03% yield). The chemical structures of isolated compounds were established on the basis of spectroscopical data as Infra-red (IR), 1D (1H, 13C, DEPT 135) and 2D-NMR experiments; Heteronuclear Multiple-Quantum Correlation (HMQC), correlation spectroscopy (COSY) and Heteronuclear Multiple Bond Correlation (HMBC) plus Mass Spectroscopy (MS) data. The 13C NMR data were assigned with the help of HMQC and DEPT 135 experiments while, the connectivity’s of the molecular fragments were established by HMBC, COSY and NOESY. The analysis of the spectra and structure elucidation was also facilitated by comparison of observed and published 1H and 13C NMR data for the compounds. Lysicamine (1): yellow needles (10.21 mg), m.p. 209–211°C, 1H NMR (CDCl3, 600 MHz) δ 7.57 (1H, s, H-3), 8.07 (1H, d, J = 5.2 Hz, H-4), 8.77 (1H, d, J = 5.2 Hz, H-5), 8.48 (1H, dd, J = 9.0, 1.8 Hz, H-8), 7.63 (1H, t, J = 9.0, 1.2 Hz, H-9), 7.86 (1H, t, J = 9.0, 1.4 Hz, H-10), 9.26 (1H, dd, J = 9.0, 1.2 Hz, H-11), 4.13 (3H, s, 1-OCH3), 4.06 (3H, s, 2-OCH3). 13C NMR (CDCl3, 600 MHz) δ 145.3 (s, C-1), 158.2 (s, C-2), 108.3 (d, C-3), 157.5 (s, C-3a), 125.8 (s, C-4), 145.0 (d, C-5), 155.6 (s, C-6a), 123.3 (s, C-6b), 182.6 (s, C-7), 132.8 (s, C-7a), 129.3 (d, C-8), 129.8 (d, C-9), 135.7 (d, C-10), 129.7 (s, C-11), 135.8 (s, 11a), 120.0 (s, 11b), 60.1 (q, 1- OCH3), 56.4 (q, 1- OCH3). MS: m/z 291 (100%), 275 (15%), 248 (84%), 233 (9%), 188 (4%), 177 (12%). The molecular mass of 1 is m/z 291 amu which is consistent with the formula C18H13NO3. All the data for compound 1 were consistent with the reported values for lysicamine, which was first isolated from Lysichiton camtschatcense (Araceae) [28, 29]. Lysicamine (1) has been widely isolated from several plant species  however; this is the first report on the presence of lysicamine (1) from A. kummeriae (Annonaceae). Trivalvone (2): brown crystals (8.10 mg), m.p. 256-258°C), 1H NMR (CDCl3, 500 MHz) δ 6.87 (1H, s, H-3), 7.54 (1H, d, J = 4.1, H-4), 8.90 (1H, d, J = 4.1, H-5), 7.76 (1H, d, J = 9.0, 2.1, H-8), 7.35 (1H, t, J = 9.0, 2.1, H-9), 7.85 (1H, t, J = 9.0, 2.1, H-10), 10.20 (1H, d, J = 9.0, 2.1 H-11), 7.18 (1H, s, H-3´), 2.95 (2H, m, H-4´), 3.26 (2H, m, H-5´), 6.70 (1H, d, H-8´), 7.12 (1H, t, H-9´), 7.43 (1H, t, H-10´), 9.75 (1H, d, H-11´), 4.07 (3H, s, 2-OCH3), 4.01 (3H, s, 1´ -OCH3), 4.07 (3H, s, 2´ -OCH3), 2.15 (3H, s, 1´ - N-CH3). 13C NMR (CDCl3, 500 MHz) δ 181.0 (s, C-1), 151.3 (s, C-2), 107.5 (d, C-3), 127.9 (d, C-3a), 127.9 (d, C-4), 151.0 (d, C-5), 156.6 (s, C-6a), 122.6 (s, C-6b), 134.0 (s, C-7), 142.5 (s, C-7a), 132.6 (d, C-8), 128.7 (d, C-9), 127.0 (d, C-10), 121.9 (d, C-11), 122.7 (s, C-11a), 136.2 (s, C-11b), 145.9 (s, C-1´), 150.6 (s, C-2´), 112.8 (d, C-3´), 130.9 (s, C-3´ a), 25.6 (t, C-4´), 49.7 (t, C-5´ ), 143.8 (s, C-6´ a), 121.1 (s, C-6´ b), 122.4 (s, C-7´), 134.4 (s, C-7´ a), 127.9 (d, C-8´), 126.7 (d, C-9´), 126.6 (d, C-10´), 124.7 (d, C-11´), 126.2 (s, C-11´ a), 127.4 (s, C-11´ b), 56.3 (q, 2-OCH3), 60.0 (q, 1΄ -OCH3), 56.6 (q, 2΄ -OCH3), 41.6 (q, N-CH3). MS: m/z 554 ([M + 2]+, 90.4%), 553 ([M + 1]+, 41.3%), 292 (M/2 + H, 8.4%). The molecular mass of 2 is m/z 552 amu, which is consistent with the formula C36H28N2O4. The absence of any fragmentation in the region m/z 552–292 suggested a dimeric structure for 2, resulting from a C-7 → C-7´ oxidative coupling between the two aporphine units . The NMR and MS data confirmed the structure of the bis-aporphine alkaloid, trivalvone (2), a rare alkaloid first reported in 1990 from Trivalvaria macrophylla (Annonaceae)  and subsequently from Piptostigma fugax (Annonaceae) . This is the first report on the presence of trivalvone (2) from Annickia kummeriae (Annonaceae). Palmatine (3): yellow solid (1.52 g), m.p. 203–205°C, 1H NMR (CD3OD, 500 MHz) δ 7.63 (1H, s, H-1), 7.04 (1H, s, H-4), 3.30 (2H, t, J = 6.3, H-5), 4.95 (2H, t, J = 6.3, H-6), 9.75 (1H, br, s, H-8), 8.09 (1H, d, J = 9.1, H-11), 8.01 (1H, d, J = 9.1, H-12), 8.79 (1H, s, H-13), 3.94 (3H, s, 2-OCH3), 4.00 (3H, s, 3-OCH3), 4.22 (3H, s, 9-OCH3), 4.10 (3H, s, 10-OCH3). 13C NMR (CD3OD, 500 MHz) δ 110.4 (d, C-1), 151.3 (s, C-2), 154.2 (s, C-3), 112.7 (d, C-4), 130.4 (s, C-4a), 28.2 (t, C-5), 56.4 (t, C-6), 146.7 (d, C-8), 123.6 (s, C-8a), 146.1 (s, C-9), 152.3 (d, C-10), 128.4 (d, C-11), 124.9 (d, C-12), 135.6 (s, C-12a), 121.7 (d, C-13), 140.1 (s, C-13a), 120.8 (s, C-13b), 57.5 (q, 2-OCH3), 57.1 (q, 3-OCH3), 63.0 (q, 9-OCH3), 57.8 (q, 10-OCH3). MS: m/z 352 (75%), 337 (6%), 336 (7%), 308 (20%), 154 (100%), 77 (25%), 39 (20%). The mass spectrum of 3 exhibited a molecular ion peak at m/z 352, which is consistent with the formula C21H22NO4 + (D.B.E 11.5). The non-integer value of the index of hydrogen deficiency suggested that 3 could be a quaternary ammonium salt consistent with palmatine (3). All the observed data for 3 were consistent with the reported values for palmatine except for the interchange of H-11 and H-12 in 1H NMR [33, 34]. Palmatine (3) has been previously reported from many plant families: Papaveraceae, Berberidaceae, Fumariaceae, Menispermaceae, Ranunculaceae, Rutaceae, Annonaceae, Magnoliaceae and Convolvulaceae . Jatrorrhizine (4): orange crystals (40.82 mg), m.p. 204–206°C, 1H NMR (CDCl3, 600 MHz) δ 7.57 (1H, s, H-1), 6.76 (1H, s, H-4), 3.17 (2H, t, J = 6.1 Hz, H-5), 4.87 (2H, t, J = 6.1 Hz, H-6), 9.67 (1H, t, br, s, H-8), 8.07 (1H, d, J = 9.1 Hz, H-11), 7.96 (1H, d, J = 9.1 Hz, H-12), 8.68 (1H, s, H-13), 3.99 (3H, s, 2-OCH3), 4.19 (3H, s, 9-OCH3), 4.10 (3H, s, 10-OCH3). 13C NMR (CDCl3, 600 MHz) δ 109.6 (d, C-1), 150.9 (s, C-2), 152.1 (s, C-3), 116.6 (d, C-4), 130.5 (s, C-4a), 27.8 (t, C-5), 57.4 (t, C-6), 145.7 (d, C-8), 122.9 (s, C-8a), 145.9 (s, C-9), 151.5 (s, C-10), 128.1 (d, C-11), 124.2 (d, C-12), 135.7 (s, C12a), 120.2 (d, C-13), 141.1 (s, C-13a), 117.1 (s, C-13b), 56.7 (q, 2-OCH3), 62.4 (q, 9-OCH3), 57.7 (q, 10-OCH3). MS: m/z 338 (28%), 176 (55%), 154 (100%), 77 (29%), 41 (25%). MS exhibited a molecular ion peak at m/z 338 consistent with the formula C20H20NO4 + D.B.E of 11.5 indicating presence of a quaternary ammonium salt. All the data for compound 4 were consistent with the reported values for jatrorrhizine . Jatrorrhizine (4) has been previously reported from several plant families: Papaveraceae, Berberidaceae, Fumariaceae, Menispermaceae, Ranunculaceae, Rutaceae, Annonaceae, Magnoliaceae and Convolvulaceae . Columbamine (5): orange solid (34.2 mg, mp. 235–240°C), 1H NMR (CDCl3, 600 MHz) δ 7.51 (1H, s, H-1), 7.00 (1H, s, H-4), 3.24 (2H, t, J = 6.0 Hz, H-5), 4.92 (2H, t, J = 6.0 Hz, H-6), 9.74 (1H, t, br, s, H-8), 8.10 (1H, d, J = 9.0 Hz, H-11), 7.99 (1H, d, J = 9.0 Hz, H-12), 8.63 (1H, s, H-13), 3.95 (3H, s, 2-OCH3), 4.20 (3H, s, 9-OCH3), 4.10 (3H, s, 10-OCH3). 13C NMR (CDCl3, 600 MHz) δ 109.2 (d, C-1), 149.2 (s, C-2), 152.8 (s, C-3), 111.7 (d, C-4), 127.8 (s, C-4a), 27.7 (t, C-5), 57.4 (t, C-6), 146.1 (d, C-8), 123.2 (s, C-8a), 145.5 (s, C-9), 151.7 (s, C-10), 127.8 (d, C-11), 124.3 (d, C-12), 135.2 (s, C12a), 120.8 (d, C-13), 140.0 (s, C-13a), 120.5 (s, C-13b), 57.5 (q, 2-OCH3), 62.4 (q, 9-OCH3), 56.4 (q, 10-OCH3). MS: m/z 338 (28%), 176 (55%), 154 (100%), 77 (29%), 41 (25%). The MS of columbamine (5) exhibited a molecular ion peak at m/z 338 consistent with the formula C20H20NO4 + (D.B.E 11.5) confirming the presence of quaternary nitrogen atom. All the data were consistent with the reported values for columbamine (5) . Columbamine (5) has been previously reported from several plant families: Papaveraceae, Berberidaceae, Fumariaceae, Menispermaceae, Ranunculaceae, Rutaceae, Annonaceae, Magnoliaceae and Convolvulaceae . (−)-Tetrahydropalmatine (6): yellow amorphous solid (28.2 mg, m.p. 204–205°C), 1H NMR (600 MHz, CD3OD) δ 6.89 (1H, s, H-1), 6.90 (1H, s, H-4), 3.28 (1H, m, H-5 eq ), 3.33 (1H, m, H-5 ax ), 3.60 (1H, m, H-6 eq ), 3.84 (1H, m, H-6 ax ), 4.91 (1H, d, J = 15.7, H-8 eq ), 4.78 (1H, d, J = 15.7, H-8 ax ), 7.07 (1H, d, J = 8.5, H-11), 6.98 (1H, d, J = 8.5, H-12), 3.15 (1H, dd, J = 18, 10.3, H-13 ax ), 3.50 (1H, dd, J = 18, 5.7, H-13 eq ), 4.76 (1H, dd, J = 10.3, 5.7, H-13a), 3.84 (3H, s, 2-OCH3), 3.85 (3H, s, 3-OCH3), 3.90 (3H, s, 9-OCH3), 3.87 (3H, s, 10-OCH3). 13C NMR (600 MHz, CD3OD) δ 111.3 (d, C-1), 151.6 (s, C-2), 150.4 (s, C-3), 115.5 (d, C-4), 125.7 (s, C-4a), 24.6 (t, C-5), 53.3 (t, C-6), 61.4 (d, C-8), 121.4 (s, C-8a), 147.1 (s, C-9), 153.1 (s, C-10), 115.0 (d, C-11), 125.0 (d, C-12), 123.7 (s, C12a), 35.4 (d, C-13), 67.7 (s, C-13a), 125.7 (s, C-13b), 53.5 (q, 2-OCH3), 56.4 (q, 3-OCH3), 63.1 (q, 9-OCH3), 56.1 (q, 10-OCH3). The MS of (−)-tetrahydropalmatine (6) exhibited molecular ion peak at m/z 356 consistent with the formulae C21H27NO4 (D.B.E 10). The odd molecular mass confirmed the presence of a neutral alkaloid. Comparison of the observed spectral data with literature values for (−)-tetrahydropalmatine (6) . (−)-Tetrahydropalmatine (6) has been previously reported from several plant families: Papaveraceae, Berberidaceae, Fumariaceae, Menispermaceae, Ranunculaceae, Rutaceae, Annonaceae, Magnoliaceae and Convolvulaceae . This is the first report on the presence of (−)-tetrahydropalmatine (6) from Annickia kummeriae (Annonaceae). The in vitro anti-plasmodial, anti-trypanosomal, anti-leishmanial and lower cytotoxicity activity of extracts from A. kummeriae were previously published elsewhere . Results of the fractionation of methanolic extract of A. kummeriae leaves by HSCCC are shown in Table 1. Of the 17 fractions 8 (47.1%) exhibited very strong anti-plasmodial activity against P. falciparum K1 strain (IC50 0.05 ± 0.01-0.13 ± 0.02 μg/ml) with excellent selectivity (SI >692), 3 (17.6%) showed strong activity (IC50 0.45 ± 0.15-0.87 ± 0.1 μg/ml) with satisfactory selectivity (SI 22.9-145.2) while the remaining 6 (35.3%) exhibited moderate activity (IC50 1.0 ± 0.22-5.0 ± 0.31 μg/ml) with moderate selectivity (SI 18.0-90.0). The anti-plasmodial activity (IC50) and cytotoxicity (CC50) of the 17 HSCCC fractions were compared with the standard drugs: chloroquine, artemisinin and podophyllotoxin. Fr. – HSCCC fraction of Annickia kummeriae leaves methanolic extract, P. falciparum K1 used for anti-plasmodial assays, rat myoblast L-6 cells used for cytotoxicity assays, CQ chloroquine (IC50 0.063 ± 0.034 μg/ml), Art artemisinin (IC50 0.002 ± 0.00001 μg/ml), Pdx podophyllotoxin (IC50 0.009 ± 0.003 μg/ml). Fractions AKLM 9–12 (IC50 0.05 ± 0.01-0.09 ± 0.04 μg/ml, SI 1,000.0-1,800.0) were of particular interest since the anti-plasmodial activity compared very well to CQ, and was only 30-fold lower than that of artemisinin, and is not cytotoxic. Others with promising anti-plasmodial activity included: AKLM 8 (0.09 ± 0.004 μg/ml, SI >1,000, 1.4 and 45 fold lower than CQ and artemisinin, respectively), AKLM 16 (IC50 0.09 ± 0.03 μg/ml, SI 933.3, 1.4 and 45 fold lower than CQ and artemisinin, respectively), AKLM 7 (IC50 0.11 ± 0.02 μg/ml, SI >818.2; 1.7 and 55 fold lower than CQ and artemisinin, respectively), AKLM 15 (IC50 0.13 ± 0.02 μg/ml, SI >692, 2.1 and 65 fold lower than CQ and artemisinin, respectively) and AKLM 6 (IC50 0.45 ± 0.15 μg/ml, SI 131.1, 7.1 and 225 fold lower than CQ and artemisinin, respectively) all of which were not toxic. HSCCC re-fractionation of AKLM 2 (IC50 0.87 ± 0.1 μg/ml, SI 22.9) gave 11 sub-fractions but only two (AKLM 2.10 and AKLM 2.11 with IC50 0.64 ± 0.34 and 0.89 ± 0.20 μg/ml, respectively) showed moderate anti-plasmodial activity against P. falciparum K1 strain as the mother fraction: (Table 2). HSCCC High speed counter current chromatography; AKLM Annickia kummeriae leaf methanol extract, P. falciparum K1 used for anti-plasmodial assays, rat myoblast L-6 cells used for cytotoxicity assays, CQ chloroquine (IC50 0.063 ± 0.034 μg/ml), Art - artemisinin (IC50 0.002 ± 0.00001 μg/ml), Pdx - podophyllotoxin (IC50 0.009 ± 0.003 μg/ml). In fact the remaining 9 sub-fractions exhibited lower antiplasmodial activity (IC50 1.09 ± 0.26-5.0 ± 0.53 μg/ml) and poor to satisfactory selectivity (SI 11.9-72.6) than the mother fraction. In the comparison of the antiplasmodial activity (IC50), HSCCC fraction AKLM 2.10 showed 13.9 and 445 fold lower activity than CQ and artemisinin, respectively) whereas, AKLM 2.11 revealed 10 and 320 fold lower activity than CQ and artemisinin, respectively). Both fractions were not cytotoxic. The methanolic leaf extract of A. kummeriae gave four pure alkaloids: lysicamine (1), trivalvone (2), palmatine (3), jatrorrhizine (4), and a pair of inseparable mixtures of two alkaloids each: jatrorrhizine (4)/columbamine (5), and palmatine (3)/(−)-tetrahydropalmatine (6), which were tested for anti-plasmodial, anti-trypanosomal, anti-leishmanial and cytotoxic activity. Bioassay guided HSCCC fractionation of AKLM 2, using P. falciparum K1 strain, led to two major alkaloids lysicamine (1), an aporphine alkaloid and trivalvone (2), a bis-aporphine alkaloid as confirmed by spectral analysis. Lysicamine (1) has been widely isolated from several plant species . However, this is the first report on its isolation from A. kummeriae (Annonaceae). Trivalvone (2) is a rare bis-aporphine alkaloid first reported in 1990 from Trivalvaria macrophylla (Annonaceae)  and subsequently from Piptostigma fugax (Annonaceae) . This is also the first report on its presence in A. kummeriae (Annonaceae). Similarly, bioassay-led HSCCC fractionation of the combined antiplasmodial fractions AKLM 7-AKLM 10, led to the isolation of two protoberberine alkaloids, which were confirmed by spectral analysis as palmatine (3) [10, 33–35, 37] and jatrorrhizine (4) [34, 35, 37]. Likewise, bioassay-directed HSCCC fractionation of the combined anti-plasmodial fractions AKLM 4-AKLM 6 yielded an inseparable mixture (1.2:1.0) of protoberberine alkaloids, which were confirmed as jatrorrhizine (4) [34, 35] and columbamine (5) [35, 38, 39] by spectral analysis. Bioassay-informed HSCCC fractionation of the anti-plasmodial fraction AKLM 16 gave an inseparable mixture (1.1:1.0) of protoberberine alkaloids, which upon spectral analysis were confirmed a palmatine (3) and (−)-tetrahydropalmatine (6) [33–35, 40, 41]. This is the first report on the presence of columbamine (5) and (−)-tetrahydropalmatine (6) in A. kummeriae. The four pure alkaloids, lysicamine (1), trivalvone (2), palmatine (3), jatrorrhizine (4) and the two sets of mixtures of jatrorrhizine (4) with columbamine (5) and palmatine (3) with (−)-tetrahydropalmatine (6) were found to exhibit in vitro anti-plasmodial activity against the multi-drug resistant P. falciparum K1 strain, anti-trypanosomal activity against the T. b. rhodesiense STIB 900 and anti-leishmanial activity against L. donovani axenic MHOM-ET-67/82 strain (Table 3). P. falciparum – K1 strain, T. b. rhodesiense – STIB 900 strain, L. donovani - MHOM-ET-67/L82, L-6 - rat skeletal myoblast cells, IC50 – inhibitory concentration for 50% of tested parasites, CC50 – cytotoxic concentration for 50% of tested cells, chloroquine IC50 0.063 ± 0.03, artemisinin IC50 0.002 ± 0.0001, melarsoprol IC50 0.002 ± 0.0001, miltefosine IC50 0.11 ± 0.001, podophyllotoxin IC50 0.009 ± 0.0003. Four protoberberine alkaloids showed strong in vitro activity against P. falciparum K1 strain (IC50 0.08 ± 0.001-0.24 ± 0.002 μg/ml) singly and as mixtures and good selectivity (SI >375) while the remaining two aporphine alkaloids exhibited moderate anti-plasmodial activity (IC50 1.6 ± 0.23-2.4 ± 0.04 μg/ml) singly and poor to moderate selectivity (SI 1.6–28.8). Palmatine (3) exhibited the strongest anti-plasmodial activity against P. falciparum K1 strain (IC50 0.08 ± 0.001 μg/ml) and a good selectivity (SI 1,154). Jatrorrhizine (4) also showed strong anti-plasmodial activity (0.24 ± 0.002 μg/ml) and good selectisity (SI >375). Protoberberine alkaloids were of particular interest as they showed strong anti-plasmodial activity which was very close to that of chloroquine as shown in Table 4. Our data indicate that, palmatine (3) and jatrorrhizine (4) with other protoberberine alkaloids such as columbamine (5) and (−)-tetrahydropalmatine (6) are active constituents responsible for the antiplasmodial activity of A. kummeriae. However, the protoberberines and the monomeric aporphine alkaloids were only moderately active against T. b. rhodesiense STIB 900 strain in vitro (IC50 2.8 ± 0.001–4.3 ± 0.0005 μg/ml) with moderate selectivity (SI 14.4-28.1) whereas the bis-aporphine alkaloid, trivalvone (2) was inactive (IC50 14.3 ± 0.001 μg/ml). Similarly, the two aporphine alkaloids showed moderate activity against L. donovani MHOM-ET-67/L82 axenic amastigotes in vitro: lysicamine (1) (IC50 2.7 ± 0.0001 μg/ml) with no selectivity (SI 1.5) and trivalvone (2) (IC50 2.9 ± 0.0001 μg/ml) with moderate selectivity (SI 15.6) while the remaining four protoberberine alkaloids were inactive (IC50 7.0 ± 0.001-20.4 ± 0.001 μg/ml). Moderate to mild anti-leishmanial activity (23.6-185.5 folds) was noted for all the isolated compounds compared to miltefosine (IC50 0.11 ± 0.001 μg/ml) as shown in Table 4. Cpd isolated compound, CQ chloroquine, Art artemisinin, Mel melarsoprol, Pdx podophyllotoxin. The literature indicate that plants that contain protoberberine and aporphine alkaloids are used in folkloric medicine as anti-hypertensive, anti-cancer, anti-septic, sedatives, analgesics, anti-inflammatory, anti-fungal, anti-bacterial and anti-protozoal [21, 40]. The in vitro anti-plasmodial activity of protoberberine alkaloids has been previously reported. However, none of them has been shown to be active in vivo[16–19, 35]. Oxygenation at C-2, C-3 (ring A) and C-9, C-10 (ring D) together with the presence of quaternary nitrogen atom in position 7 in protoberberine alkaloids have already been identified as the structural motifs required for strong antiplasmodial activity . The relationship between the oxygenation and the antiplasmodial activity provides clues for possible molecular frameworks for synthesis and structure-activity relationship studies which might lead to the identification of pharmacophore(s) for new generation of isoquinoline anti-plasmodial drug(s). To the best of our knowledge, this is the first report on the anti-plasmodial and anti-leishmanial activity of A. kummeriae, in vitro anti-trypanosomal activity of palmatine (3); anti-plasmodial, anti-trypanosomal, anti-leishmanial and cytotoxicity activity of trivalvone (2); anti-leishmanial and anti-trypanosomal activity of jatrorrhizine (4) and of the two sets of mixtures: jatrorrhizine (4)/columbamine (5) (1.2:1.0) and palmatine (3)/(−)-tetrahydropalmatine (6) (1.1:1.0). The present phytochemical and pharmacological results indicate that A. kummeriae, a traditional remedy for malaria and fever, exhibits a wide array of biological activities, which could be attributed to the constituent aporphine and protoberberine alkaloids. The protoberberine alkaloids exhibit good antiprotozoal activity in vitro and comparably low cytotoxicity. In contrast, the activity and selectivity of aporphine alkaloids is moderate. Given the reported lack of in vivo activity of protoberberine alkaloids, further investigations should focus on a better understanding of their pharmacokinetic properties, and on possible improvements through synthetic modifications. The German Academic Exchange Program (DAAD) for supporting this work by award of a scholarship grant A/03/44009 to H.M.M. The International Foundation for Science (IFS) through project grant F/3767-1 and Canton Basel Stipend Commission for the research visit grant to the Swiss Tropical and Public Health Institute (STPHI), the Institute of Organic Chemistry at UNIBAS and the Institute of Pharmaceutical Biology (PharmBio) at UNIBAS in Swizerland. Extraction and initial isolation of compounds was carried out at the Department of Traditional Medicine at the National Institute for Medical Research (NIMR) in Tanzania and the Department of Chemistry at Kenyatta University in Kenya. NIMR, the Institute of Organic Chemistry (UNIBAS), PharmBio (UNIBAS) and the STPHI are gratefully acknowledged for provision of laboratory space, supervison and financially supported this project. HMM conceived the project. HMM, TW, MC, MOO, DH and PD performed the experiments. IN, SMS, AH, US, MH and RB supervised the work. All authors evaluated the results and revised the manuscript for publication. All the authors read and approved the final manuscript.